Ask fellow campers about "Wildhorse Resort and Casino RV Park" and nearby attractions. Nice park. Just what we needed for one night. Quiet. Convenient to I-84. We are 65 feet with trailer so they put us in an outside spot so we could hang over the edge. Their pull-thrus are only 60 feet. Things that we look for in an RV park: Space to Maneuver, Long pull-thrus, good utilities (50 amp), convenient to our highway, no travel through town, GPS accuracy. So we were happy with everything except that we had to back up into our space with the trailer. But we knew that going in. 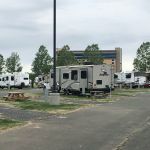 There appeared to be a lot of RVs in the parking lot of the casino. Maybe people just stayed in their RVs overnight in the parking lot. We camped at Wildhorse Resort and Casino RV Park in a Motorhome. We've stayed here several times. Appreciate the continuing upgrading they do in the park. Power, sewer (2 drops available at many sites), it all takes time. We had to drop a board under one tire to get level, no big deal. Only thing that bothered us was having to stop at the office when leaving to get a receipt. Why? Staff were friendly. Shuttle to/from the door, but walking to the casino, restaurant was easy. WiFi was ok; no cable. We camped at Wildhorse Resort and Casino RV Park in a Travel Trailer. After a major overhaul of the electric system, they neglected to level the trenches properly so now the rv lots are worse then before , extremely uneven, the price has increased substantially which is uncalled for until at least the pads are leveled We camped at Wildhorse Resort and Casino RV Park in a Fifth Wheel. Definitely big rig friendly, with fairly wide asphalt interior roads and plenty of back-in and pull through sites. Each site has an asphalt pad and a picnic table with some grass between the sites. Although there are trees throughout the campground, none are directly shading a specific campsite. Probably pretty warm in the middle of summer. Others have indicated the spaces were somewhat tight, but but while spacious, they were jammed together either. We just overnighted, so didn't take time to visit the casino or use the golf course. 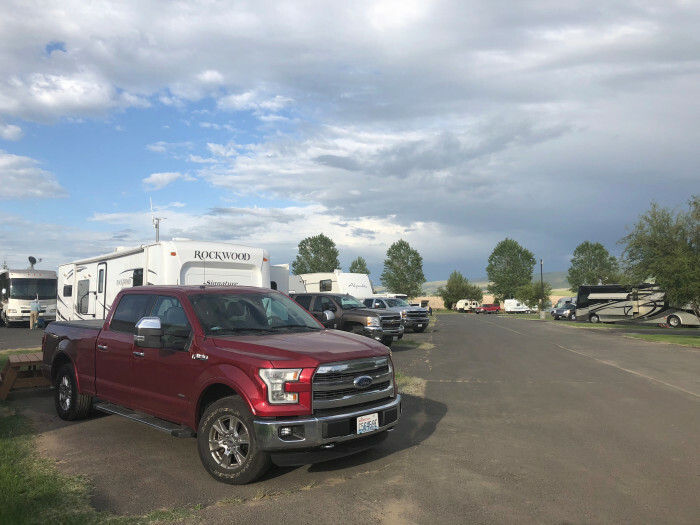 If you're wanting to stay here during the Pendleton Round-Up in September 2019, check on reservations as soon as possible; the camp does fill up fast and early! To our way of thinking, this is not a destination site, but a very good overnight spot. We'd stay here again. We camped at Wildhorse Resort and Casino RV Park in a Fifth Wheel. Level pull through gravel site. Grass had not been mowed for a while. Sewer hookup need almost 3 lengths because we did not unhook the toad. Good wifi but we were right across the lane from it (site 37). A little expensive, we thought. Had to go back to the office and check out, which was cumbersome. But a good stopover. Buffet was very good. We camped at Wildhorse Resort and Casino RV Park in a Motorhome. Very easy check in and staff friendly. The sites are a little to close together but not what I would call tight. Didn't go to casino but did go into town for underground tour, which was great. Sites were long enough to stay hooked up if a overnight stop is what you want, We are appx. 60 feet when hooked up. Had outside pool and hot tub but didn't use. All hook ups worked great and you have 2 sewer hook ups to choose from. The park is quite would stay here again. We camped at Wildhorse Resort and Casino RV Park in a Motorhome. Stayed for several nights. The sites are close without any privacy in the pull thrus. The back in spots are the best. The back row backs up to undeveloped area. It is way over priced for casino campround. A shuttle runs all day and night. They want everyone in the casino and then charge a lot for the sites. We camped at Wildhorse Resort and Casino RV Park in a Motorhome. Stopped here for one night. Campground had shuttle to casino. Ate at the buffet which was good. Worked fine for us but we thought a little expensive. We camped at Wildhorse Resort and Casino RV Park in a Motorhome. We have stayed here multiple times on our way to the coast. The park is always clean and well maintained. The sites are long enough that I do not have to unhook my truck (We are about 60 feet long when hooked up) and wide enough that I can park my UTV next to the truck on the paved spot. Our spots have always been paved and level. They have a on call shuttle to the Casino that is there very quickly and comes right to your spot at all hours. The food in the Casino is great. Water pressure is good and they have both 50 and 30 amp power. Great place to overnight. The dogs liked it too because of surrounding fields to run in and nice green areas to walk. We camped at Wildhorse Resort and Casino RV Park in a Travel Trailer. 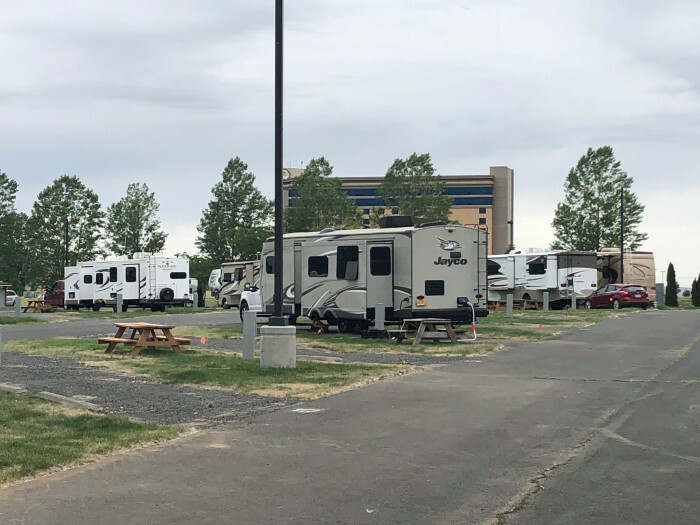 This is a large RV park close to I-84 and next to the casino. Roads are paved and wide enough. Back-in sites are around the perimeter and pull-through sites are in the middle rows. Some sites are paved but most are gravel, level, fairly close together, and of moderate length with FHU and 30/50 amps. Bathrooms, laundry and a small pool are located only at the office. There is green space along the outside of the park to walk a dog. There is a shuttle to the casino but it is within walking distance. This is an adequate place to stay but it seems expensive for a casino. We camped at Wildhorse Resort and Casino RV Park in a Motorhome. I always enjoy going to the Pendleton Woolen Mill. What a rip off. A bare bones RV park at it's best. They add insult to injury, and they are very up front about it. The busier they are, the more they charge. In the past a back in site was $28. This time it was $53 for the same site. With a Good Sam discount. Ridiculous, especially for a casino campground. Be very sure you call in advance and know what their rate is. It's very rare when a private campground costs more than the local KOA. The first campsite they assigned me was in the back row slum. When I asked for another site they moved me to the furthest out site. Having said all that, the site was short and level. Power and water were good. WiFi was marginal but OK for e-mail. Our last time camping here. We camped at Wildhorse Resort and Casino RV Park in a Travel Trailer. The casino now has a buffet every night. Food was plentiful but bland. spaces are close and not very level. We stayed in an outside row back-in space and had a great view and more room between rigs. O.K. area for dogs. We camped at Wildhorse Resort and Casino RV Park in a Fifth Wheel. We were going to stay in the designated 'FREE' RV parking area in front of the casino, but it was cold and raining. We opted for the back RV park with FHU and a free shuttle. The rate is a bit high for the condition of most of the pads. 1/2 are gravel/stone and very un-level with deep sink holes to avoid when leveling. Saturday buffet was great, $29 for 2 and great choices of food. Would stay again, but likely in the 'FREE' area out front. We camped at Wildhorse Resort and Casino RV Park in a Travel Trailer. 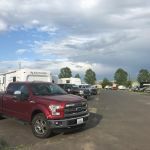 Pricey for a parking lot-style campground, but maybe worth it if you are interested in the co-located amenities (golf course, casino, movie theater, pool, hot tub, and a free shuttle into town). The back in sites around the edge are a little nicer than the pull-through sites in that you back up to a grassy area. Customer service was fantastic. The park looks nice, except for the grass, but that is because they just finished a big upgrade where they tore a lot of the grass out. It should be really nice once the grass all gets going again. The laundry room was clean and modern. Wifi was excellent, though the park was only half full when I visited. The casino buffet was reasonably priced but lacking in salad and vegetable options. We camped at Wildhorse Resort and Casino RV Park in a Motorhome. Nice and spacious park near the casino. Spaces were flat and each one had two sewer connections, one at the back and one at the center. I haven't seen this before, and it is a great idea. We're not casino people, but went in to check out the restaurants. After looking around, we decided to drive into Pendleton for dinner. We camped at Wildhorse Resort and Casino RV Park in a Travel Trailer. Casino adjacent with regular busses, and vans for transportation. Go to Pendleton! Lot of great shops, the Pendleton Mill, great restaurants, too. Casino on site along with cinemas, restaurants, kids stuff. Lots to do. Park has a swimming pool adjacent to the check-in area. Dumpsters are conveniently located throughout the park. We did the Underground Tour in Pendleton which was very interesting. We played golf at the Wildhorse golf course which was very nice. We also took in a movie at the casino, which was nice. However, we were disappointed in the the buffet at the casino. We were just here for an overnight, plenty to enjoy at casino. Located on casino grounds and trams will take you to the casino or you could walk, not far. Pendleton Mills tour is great. The tours at Pendleton Mills and the Underground are great. The casino has a movie theater. We made use of the casino's shuttle service to get to the casino one night, although it is only a quarter or half mile walk there. We ate a buffet dinner there which was a terrific deal at $17. Roast beef and shrimp cooked several ways. All the items were tasty. My wife particularly is not a fan of buffets, but she agreed this was a great meal. We learned there was a parade in Pendleton. I called the hotel and they would send a shuttle to take us there and pick us up later! We did that, and it turned out very worthwhile. Must see the underground town in downtown Pennington: the tour is very interesting. Also the Great Northwest Sandwich Shop is a notch above the rest: very good. Casino, gas station close by. For those travelling N/S on 395, its a few miles down the road, but worth it. Check out the tour at Pendleton Wool. Very interesting. Not a lot going on in Pendleton this time of year. Went to the Pendleton woolen factory which was interesting. The restaurants in town were ok but over-priced. The Umitilla National Forest was nice to visit and hike at 4900 feet elevation. The casino next door is incredibly smoke-filled, so if you don't like smoke, stay out. The Pendleton Riverwalk is ok but in need of landscaping. Gamble and gamble and pay $6.00 dollars for a 4 ounce plastic cup of cheap wine. Would stay again, but take my own wine. Walmart, Safeway and other amenities available in Pendleton about 3-4 miles down I84. A visit to the Pendleton Mill is worth going. They have a store to purchase all kinds of Pendleton wear and there is a tour of the factory which was very interesting. The Snowbirds use this as a stopover when going South for Winter or North for Summer an can fill up pretty quickly in the evenings. I recommend reservations if you'll be arriving late. Many things to do at or around the area (Casino, Tamastslikt Cultural Center, Pendleton Aquatic Center, Pendleton Woolen Mills, Pendleton Underground Tours, to name a few). Next to the Casino, the Arrowhead Travel Plaza is a full-service truck stop offering McDonalds, reasonable fuel prices, and their website homepage shows traffic conditions on cabbage hill via four live ODOT webcams. Nearby casino has a good buffet. Pendleton is very nice town to visit. Virgil's is a good steak restaurant. Shop before you pull into your site. Pendleton is close by and nice small town atmosphere. Golf course adjacent to RV Park attractive. Plenty of area to walk dogs. Are you affiliated with Wildhorse Resort and Casino RV Park ?